Wednesday, 10th July 2013. Palm oil futures shy away from breaking its four sessions high as market participants await MPOB and cargo surveyors report. Other news to follow. "-U.S. stocks climbed on Tuesday, pushing the S&P 500 to within 1% of its all-time closing high, as Wall Street embraced an improving economy and higher interest rates. The S&P 500 index SPX +0.72% added 11.86 points, or 0.7%, to 1,652.32, with materials pacing sector gains. The Nasdaq Composite COMP +0.56% rose 19.43 points, or 0.6%, to 3,504.26, lifting it above its May 21 close of 3,502.12, which was its highest finish since the year 2000." "-HONG KONG (MarketWatch) -- Hong Kong stocks pulled higher early Tuesday as positive cues from the U.S. helped lift most regional markets, although trading was choppy as investors digested data showing Chinese consumer prices rose faster than expected in June. The Hang Seng Index HK:HSI +0.49% gained 0.4% and the Hang Seng China Enterprises Index added 0.3%. China's Shanghai Composite CN:SHCOMP +0.37% fell 0.1% after changing direction a few times; the index had slumped 2.4% on Monday." "-Oil futures climbed well above $104 a barrel in electronic trading Tuesday evening following news that the American Petroleum Institute reported a 9 million-barrel drop in U.S. crude supplies for the week ended July 5, according to reports. A Platts survey of analysts showed a forecast for a 3.8 million-barrel decline. "This is a big shock," said Phil Flynn, senior market analyst at Price Futures Group. "While most were looking at another drawdown in supply, no one expected this drop." Following the data, August crude CLQ3 +0.72% traded at $104.72 a barrel in electronic trading, above the $103.53 settlement on Nymex. " "-August Soybeans finished up 23 1/2 at 1455 1/2, 4 off the high and 28 3/4 up from the low. November Soybeans closed up 24 at 1252 1/4. This was 27 1/4 up from the low and 1 3/4 off the high. August Soymeal closed up 13.5 at 442.1. This was 14.0 up from the low and 0.9 off the high. August Soybean Oil finished down 0.18 at 46.96, 0.34 off the high and 0.18 up from the low. August soybeans traded higher on the day but the upside gains were led by strength in the November contract. 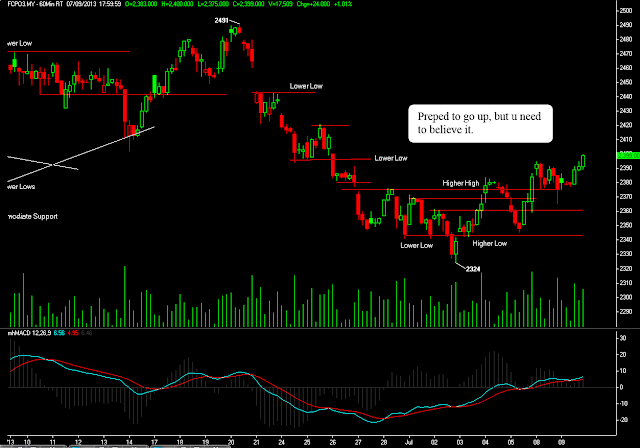 Thoughts that the move lower from last Friday was overdone and an improved technical outlook is supportive short term. The meal market also traded higher on the day which helped to lead soybeans to the upside as well. Physical traders noted non-existent soybean movement in some regions and it was becoming difficult to source supply. Meal premiums were steady midday but weakened in some areas of the west yesterday. The progress report suggests that nearly 4 million acres of soybeans have not emerged as of July 7th which is raising questions as to the health of the crop in the northern tier of the growing region and yield prospects going forward. The Brazilian government agency CONAB estimated their countries 12/13 crop production forecast to 81.5 million tonnes, up from their prior forecast of 81.3 million tonnes. The USDA is estimating production at 82 million tonnes. Dock workers at Brazil's key shipping port of Santos are planning a 24-hour strike today on protest of government reforms. The union is discussing another strike for July 11. Any significant delays to loading or shipping vessels could be supportive short term." Stock index is heading into a phase call "waiting" and it may also turn into a stage call pausing on previous positive momentum after the market survive from previous swift correction last two weeks ago. The spot month contract closed slightly unchanged to 1,769 level with thinner volume traded yesterday. Market is still shy from breaking above the 4 weeks high around 1,800 level as most trading participants still prefer to trade what is available inside the current range. If you unaware, the spot month contract is still hovering within 1,783~1,760 on this week range while 1,800~1,720 for a longer time frame range. Market is likely travelling lower if the spot month contract manage to take out below 1,760 level while it could also continue to head upwards if the 1,785 level is taken out. Traders have what it call a trade-able range to trade with for the moment while await either one side of the range get breaks out. For today, pivot support for July contract is located around 1,765 , while ressitance is pegged at 1,775. Anyone tapping out recently ? It is no surprise a lot of individuals traders found trading is the toughest profession they ever got into, especially when they are trading on their own money. Some self or private traders took year to slowly hone their skills and become a prominent trader , some require only few months to get better. Whenever the time frame you require to become a full time trader, it require a realization or that "ahaa" moment that no one can teach or show you, else you would not realize it yourself. The moment which known as the pre-requisite to be a full time trader, and that will be devoting yourself to trade full time, not part time, no excuse. If you wish to become a professional, you have to 100% devoted to it and done it full time. Can you find a part time doctor, engineer or an architect ? No, because they would not perform on par with industry standard if they have done it part time. Alright, back to the market, FCPO is travelling on high note at the moment but still pending to breach its four sessions high at 2,395 even though the market sentiment is now slightly recover. Maybe we need more than good news to push up the price beyond 2,400 this week, maybe if the soy oil for Aug contract manage to stay up and continue to recover higher above 47.40 per pound, FCPO would stand some chance to break out from its upper range. And if this condition does materialize, we can look forward to more upside potential and of course more chances for the market to recover further. 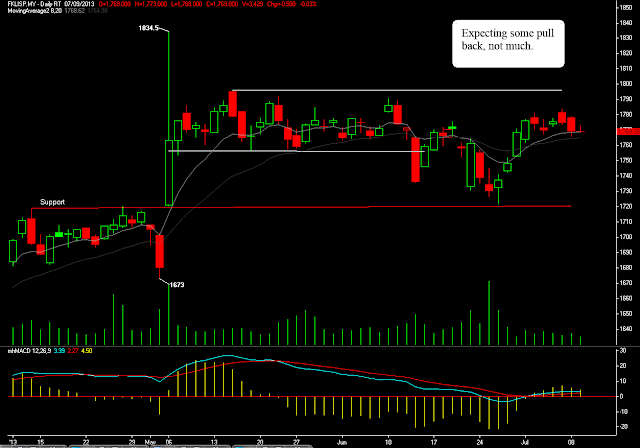 Else if the market fall back, current support will be located around 2,364. Nasty sideways range is expected to occur if the Sept contract retrace below this level.